Gentle Dental Care is now serving the community of Montgomery with family, pediatric, and emergency dental services! As part of our commitment to serve the great communities of Montgomery County, we opened our new office at 16145 Hwy 105 West, #400, Montgomery, TX 77356. Our office provides general, pediatric, emergency, family, and cosmetic dental services to folks in Montgomery, Conroe, Dobbin, and surrounding areas. 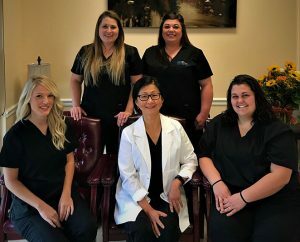 The dentists, specialists, and assistants of Gentle Dental Care in Montgomery aim to provide a comfortable experience. We don’t want you dreading your dental appointment. Our state-of-the-art dental office uses the latest in cutting-edge technology and treatment techniques for all emergency, pediatric, and family dental services in Montgomery. Without a doubt, you can trust you will get the best dental treatment possible from our caring Montgomery dentists at Gentle Dental. Many patients are self-conscious about their smile. Regardless of what the imperfections are, the Gentle Dental dentist is Montgomery can help. If you are concerned about your teeth not being straight enough, we offer Invisalign™, one of the most popular clear align brace alternatives available. We take an impression of your teeth, send it to the lab, and your Invisalign™, designed specifically for your mouth, will be available for your use within two to three weeks. Do you have concerns about your teeth not being white enough? ZOOM® is a revolutionary teeth whitening system that can make your teeth up to 8 shades lighter in just one 45 minute visit! Plus, you will experience little to no sensitivity with this in-office whitening treatment! Are you ready for your cosmetic dental treatment? Click here to set an appointment today! Regular dental check-ups go a long way towards preventing certain oral cancers and other diseases. These dental exams and dental cleanings can help discover serious problems early, and thus you can be placed on a treatment plan before things could potentially get worse. Gentle Dental Care recommends that you have a dental cleaning once every six months. Dental cleanings from our experienced dentists in Montgomery can remove nasty biofilm, plaque, and tartar that causes unattractive bad breath. Also, these dental cleanings are a good preventative measure. Some of these disorders that regular dental cleanings prevent include periodontal disease, tooth decay, oral cancer, and gingivitis. Dental cleanings are covered by most dental insurance companies. Schedule yours today. Your child’s oral health is important. We have a pediatric dental specialist at our Montgomery, TX location. Our pediatric dentist in Montgomery provides emergency dental services, mouth guards, retainers, braces, and aligners. This is in addition to our regular dental check-up services. Schedule your child’s dental appointment today. © Gentle Dental Care. All rights reserved. Optimized by Actual SEO Media.